Many people I have spoken with were amazed that I could get a Michigan grown apple in the middle of July, even before the first locally grown peach shows up. There are some super early varieties out there. One such is the Transparent apple also called Yellow Transparent (sometimes even white transparent), although they are really more green than yellow. This variety was first discovered in Lativia and made it’s way over to North America circa 1870. 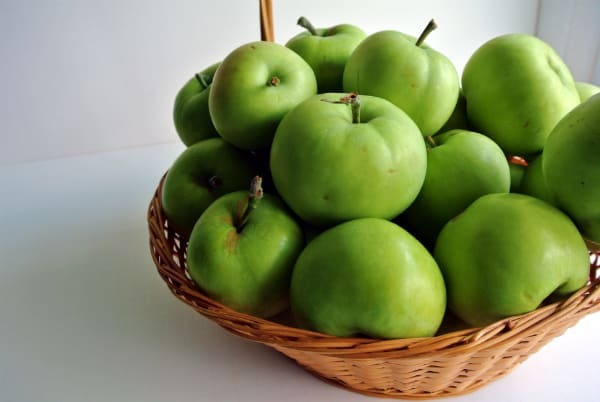 Overall Feeling: Before I bought these apples I was told they were good for making applesauce, so that was my plan all along, But before I cooked my sauce, I tried one and knew there was no way I wanted to take another bite. These are extremely tart apples! They are also juicy apples that aren’t too crisp, which is what makes them perfect for applesauce, not to mention for adding to a green juice that is all that rage right now. Check out my recipe below for Transparent applesauce. “The recipe” is more of an instruction guide than a measurement of what you need. In 2012 a warm March lead to several freezes in April that almost wiped out the entire Michigan apple crop. The farm that I bought my Transparent apples from were apple-less in 2012. After a two year wait and a facebook message that they were there I finally got my hands on some. The last time these apples were available my 2 year daughter couldn’t even walk. Now she was walking around with me at the market, begging to try one of these apples. I was thinking to myself, ok I will let her try one but I know she isn’t going to finish it. I handed her one in the van ride home and she was still chopping away on it as we walked in the door! Guess Transparent apples aren’t too tart for my little girl! Being that it’s an early apple variety the shelf life on Transparent apples is very short. They are not keepers. Grocery stores are unlikely to carry them. You will have to go directly to the farm, either at the farm or at the farmer’s market. Remove the core of the apples. Remove the skin only if you do not have a food mill. Quarter the apples. Place into a slow cooker set to high. Allow the apples to cook until they can be mashed with the back of a spoon. If the sauce is too thin, cook it longer with the lid off until it reaches your desire consistency. If you are using a food mill, run the sauce through the food mill. Add honey or brown sugar stirring well until the sauce is as sweet as you want it to be. What an enjoyable post! My Dad owned an apple orchard. Red Astrachan is the apple I learned to make apple pies with as a young girl. I’ve never seen nor heard of this variety for many years. So glad it’s still around. And wish I could take a bite! I just canned 38 pints of applesauce made with Transparent apples. There’s a much easier way to make any applesauce. Quarter/core the apples with skin On, and add a bit of water and simmer until cooked and mushy. Then run the batch thru a food mill, it comes out as smooth as silk. I then process at 6 lbs pressure for 10 minutes. Thanks for the comment. I use a food mill too when I am doing a big batch. Sometimes I will make smaller batches just for a meal that I want to be more chunky, so I just peel them before cooking. 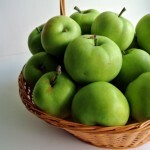 I am interested in finding Yellow Transparent apples by the bushel when in season. My mother used to make the best applesauce from these apples, but we cannot find them anymore. I am in NJ so eastern PA, NY state, or NJ would be great but I’d be willing to have them shipped if necessary. I personally do not know of anywhere to get them in your area. They aren’t the kind of apple you find at the grocery stores. It’s one you have to get from your local farmer. I grew up on a farm in Indiana in the 1950’s and we had a Yellow Transparent apple tree. I remember the tart taste and the juiciness. I loved eating them raw, tart taste and all. The juice ran down to my elbow. They were fantastic. I cannot seem to find them anymore. Most people favor sweet apples but I loved the tart ones. Jonathan was another favorite. My parents are fortunate enough to have a Transparent apple tree on the property adjacent to theirs. There are a couple of older folks who used to live in the neighborhood who now come out in the early fall to harvest some of the best sauce and pie apples on the planet! I am going to suggest to my spouse that we plant a couple on our property when we retire from the navy in three years. Yellow Transparent was the ONLY fruit trees that we had on our small dairy farm in Northern Illinois. Every year, in late July or early August we were making sauce and pies. They make the best applesauce I’ve ever had. We always used white granulated sugar instead of brown sugar. It takes quite a bit of sugar and we always made one large batch that was more tart. We used to pick them up from the ground several times a day and work with them. We always washed the apples, cut out a bad spot, quarter them with some water and simmer them on low. Once they were soft, we would run it through a sieve with the wooden jammer, cool…..and froze them in quart containers or baggies. YUM! Thank you all for your information. We have 3 Transparent apple trees in our yard in Colorado at 7500 foot altitude. The apples are not very big, but these trees have not been taken care of for 25 or so years, so they are just now starting to come back. The apples are just right now, and I plan to use them in apple butter. My Mom’s favorite recipe. Thanks again! Transparent apples make excellent pie, but it does take extra sugar. We have two transparent trees in the Seattle area on our farm. My experience is that they’re very tart if harvested too early. If picked at the point where some start to fall (about mid August for us), they’re very eatable. Transparents make excellent pies and applesauce, and they break down fast when cooking. Gravensteins are another great old pie apple if you can find them. These will sometimes show up for maybe 2 weeks in the stores in this area. I grew up with these apples in our back yard and my mother would harvest and process the apples (peel, slice, and core) and freeze them in bags with all the ingredients for a pie filling measured out so one bag = one pie. Then all year long we could have a quick apple pie by dumping the bag in a crust and baking. The best apple for a pie I ever ate! I had never heard of them other than in my parents yard so thought it was just some name my parents tagged them with. Glad to know they are real and I can actually track some down again. I’ll be checking out the grower you mention next summer since I’m in the Detroit metro area! Got some at the Sarah Hardy Farmer’s Market in Traverse City, MI, today from the Amish farmers. I’m in the middle of making apple sauce with them as I write this. Awesome! Let me know how it turned out. I grew up in Virginia and could not wait for late June and the “June” apples as we called them. From the time they ripened all we did was can applesauce and apple slices to fry later. (They make yummy fried apples!) We had many other fall apple trees but I really didn’t care…I lived for the June apples. When the poor tree grew old and on it’s last leg(or limbs) I was sad. My visit home after the last season, my mother gave me the very last jar of applesauce and I so enjoyed it on one hand, but dreaded when it was gone on the other. Since I have lived in FL for the last 40 odd years, no good fresh apples for me BUT I am moving to Mississippi to be near my son and his family and I have planned on giving them a transparent apple tree! One thing I just found out that is ironic is that the tree originated in Russia and my son teaches Russian history and has spent a good deal of time in Russia. Thank you for the informative post. Oh, I loved eating the apples right off the tree…not too tart for me! Thank you so much for sharing your story. Wonderful to hear such treasured memories. My friend moved to Florida and he expressed the same thing. I can’t imagine not living in a good apple state! I live in Oregon, am 83 years old and have made transparent applesauce my whole adult life. I freeze it for winter also. Much simpler now than in the old days. Just cook the apples in the microwave add sugar at the end, works great. Gravenstein apples are also good for qpplesauce but I make pies out of them mostly.